Summary The vision of the principals and architects was an energy self-sufficient house with a flat roof and a photovoltaic system. But the commune and their development plan didn’t allow that. The only possible technical compromise that could be authorised was the asymmetric pitched roof with flat slope and therefore a sufficient huge roof area for the solar use to the southwest. The creative main approach was the mounting of the building structure between several parallel running shear walls. 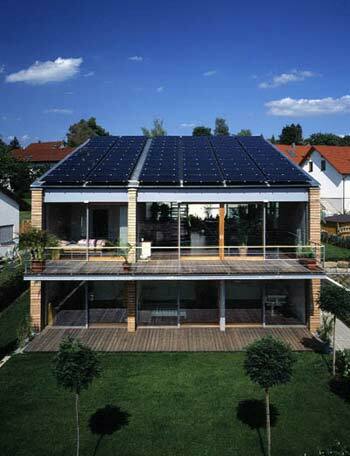 The structure should also be realised with the façade and together with the solar system form a creative unit. The compact architecture (A/V-relation 0,58), a high efficient insulation, the spacious measured photovoltaic system and the ground heat pump give the building a neutral yearly-energy-balance.